this tip is more about personalisation than automation — but it can still save you some time. different types of jobs require different tools. it makes sense to change your tool kit to suit your job, so that your screen isn’t cluttered with lots of unnecessary stuff. this is what workspaces are for. a workspace saves which panels you have open and where they appear on the screen. this has two key advantages : if you have a saved workspace you can quickly declutter your screen if it starts to get a bit out of control; and by using multiple workspaces you can have different setups for different tasks — for example, you may have one set of panels open when you are working on interactive documents, but a completely different set when you’re working with lots of tables. 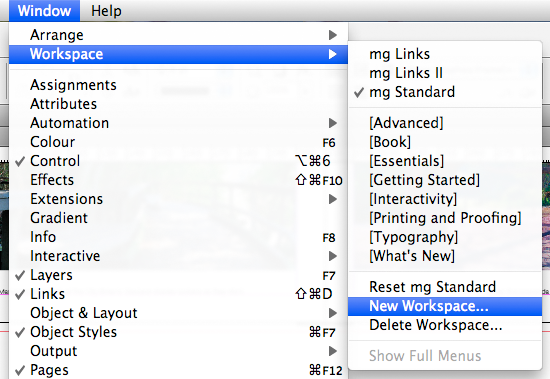 from CS3 onwards, a workspace also saves your menu customisation (did you know that you can customise your menus now? — check the bottom of your ‘edit’ menu). note: in later versions, for some reason, if you’re already using a particular workspace and it becomes a bit messy, you can’t revert by simply selecting it again from the list. you need to go further down and select reset [your workspace name]. that’s a really strange change from the simpler functionality in CS2. 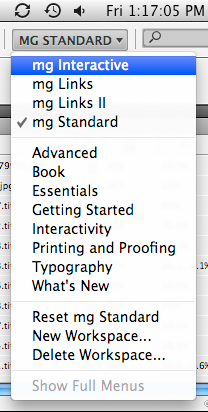 This entry was posted in indesign, indesign tip and tagged adobe, how to, InDesign, tip, tutorial, workspaces by macgrunt. Bookmark the permalink.